Remember the New Kids on the Block cartoon? 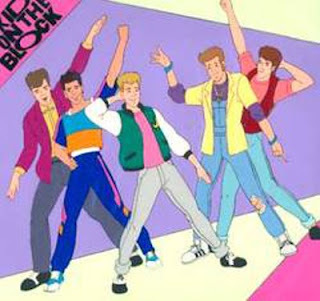 Between 1990-1991, New Kids on the Block had their own animated ABC TV show featuring the band in teen sitcom style situations. The group appeared in live bits before each cartoon began, but due to legalities, actors voiced the different members of the group. I was too old and too cool for NKOTB, however I remember the younger kids lovin' on them big time. By the time this cartoon aired, I was off to college. Does anyone remember watching Donnie, Jordan, Joe, Jonathan and Danny in cartoon form? Though the cartoon was only on for about a year, Disney Channel picked the series up and aired the repeats. Here's a clip of the New Kids on the Block cartoon for you. As the original Mrs. McIntyre, I remember this show vividly. It was also the beginning of the end. Tsk, tsk. I was a huge fan of NKOTB around that time, and I'm sure I watched it although I don't actually remember watching it from looking at this clip. What I DO remember is loaning my KNOTB cassettes to a friend after we graduated high school and she lost them! She still apologizes to this day because she never did find them. I remember that show...man that makes me feel old! I think I was too old, but I still remember it. Those voices are awful! Oh, this is too cool! How did I miss this cartoon? I was one of the little kids who were in love with them. :) I went through having a crush on several of them. First Donny, then Joey, then Jon. Then back to Donny. Haha. NKOTB is such nostalgia for me!